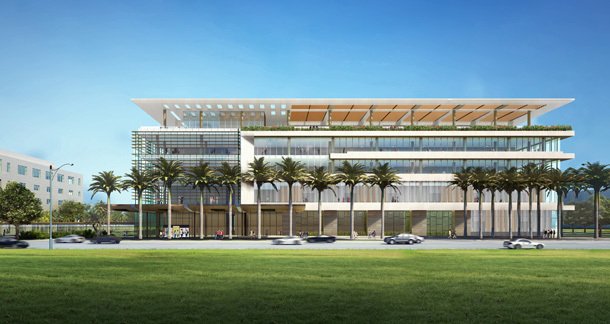 The University of Miami Health System has announced plans for a 200,000-square-foot ambulatory center on the University’s Coral Gables campus that will provide students, faculty, staff, and surrounding communities easy access to UHealth’s leading physicians. The UHealth at Coral Gables facility will deliver premier services of the Miller School of Medicine, including specialty care by the renowned Sylvester Comprehensive Cancer Center and Bascom Palmer Eye Institute, ranked the No. 1 eye hospital in the nation for the past 10 years. The facility also will include urgent care, out-patient surgery, men’s and women’s health, physical therapy, diagnostic imaging, radiation oncology and other UHealth subspecialties. A rendering of UHealth at Coral Gables shows the 200,000-square-foot center on Ponce de Leon Boulevard. The LEED-certified outpatient facility, designed by architects Perkins+Will, will be located at 5550 Ponce de Leon Boulevard, a short walk from the University Metrorail station. An air-conditioned bridge will connect the center to an adjacent 1,000-space parking garage. Groundbreaking will take place this summer, and the center is scheduled to be completed in the summer of 2016. Future plans include moving the UM Student Health Center from the academic core of the campus to the new UHealth Coral Gables facility. This will give students convenient access to all UM medical specialties. As South Florida’s only university medical system, UHealth is a vital component of the community. The University of Miami Health System delivers leading-edge patient care by the region’s best doctors, powered by the groundbreaking research and medical education of the University of Miami Leonard M. Miller School of Medicine. UHealth’s comprehensive network includes three hospitals and more than 30 outpatient facilities in Miami-Dade, Broward, Palm Beach, and Collier counties, with more than 1,500 physicians and scientists. For more information on UHealth at Coral Gables, visit www.uhealthsystem.com/locations/coralgables.